This study investigated the effects of antioxidant vitamin supplementation upon muscle contractile function following eccentric exercise and was performed double blind. Twenty-four physically active young subjects ingested either placebo (400 mg; n = 8), vitamin E (400 mg; n=8) or vitamin C (400 mg; n = 8) for 21 days prior to and for 7 days after performing 60 min of box-stepping exercise. Contractile function of the triceps surae was assessed by the measurement of maximal voluntary contraction (MVC) and the ratio of the force generated at 20 Hz and 50 Hz tetanic stimulation before and after eccentric exercise and for 7 days during recovery. Following eccentric exercise, MVC decreased to 75 (4) % [mean (SE); n = 24; P < 0.05] of the preexercise values and the 20/50 Hz ratio of tetanic tension from 0.76 (0.01) to 0.49 (0.03) [mean (SE); n = 24; P<0.05). 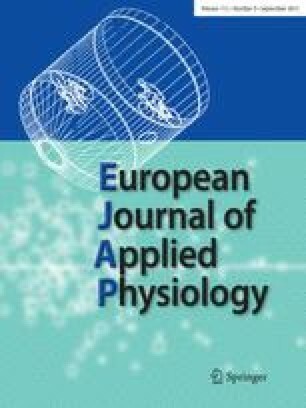 Compared to the placebo group no significant changes in MVC were observed immediately post-exercise, though recovery of MVC in the first 24 h post-exercise was greater in the group supplemented with vitamin C. The decrease in 20/50 Hz ratio of tetanic tension was significantly less (P < 0.05) post-exercise and in the initial phase of recovery in subjects supplemented with vitamin C but not with vitamin E. These data suggest that prior vitamin C supplementation may exert a protective effect against eccentric exercise-induced muscle damage.